We promised we’d end our Divergent Month with something completely different! 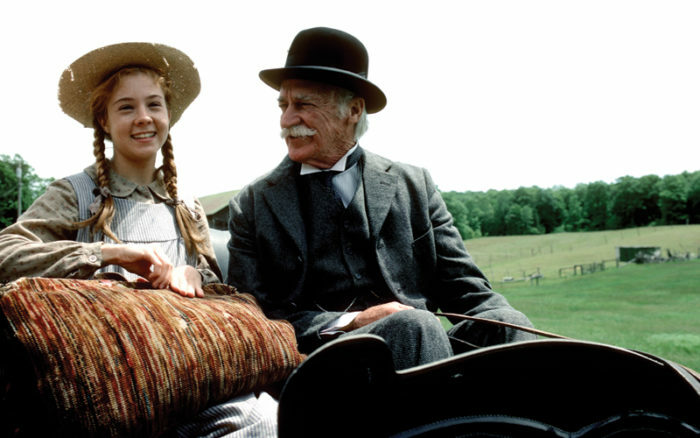 This week, to cap off our month, and as Canada’s Sesquicentennial celebration gets underway, Ariel ate her darts by watching the 1985 Sullivan Entertainment rendition of Anne of Green Gables, starring the inimitable Megan Follows. This version of the novel by cherished Canadian author and Prince Edward Island native Lucy Maud Montgomery is regarded the world over as the definitive depiction of miss Anne Shirley. The much beloved miniseries swept the 1986 Gemini’s, and also took home an Emmy and a Peabody award, just to name a scant few of its accolades. Anne (with an “E”) has resonated with children the world over since her birth in 1908, and became a newfound icon for generations to come with this particular portrayal. Listen as Ariel discusses the profound experience of discovering Anne in her late 20’s, her sadness over not having grown up with this fictional friend as a child, and all the wonder and joy that comes from meeting this delightfully verbose heroine of Canadian fiction. This Canada Day, for its 150th year since Confederation, it is important to learn more about what our government is doing to advance reconciliation with Indigenous peoples. Consider donating to some wonderful organizations such as the Native Women’s Association of Canada, Canadian Feed the Children’s First Nations Program, Indspire, an Indigenous-led charity investing in the education and future of Indigenous people of Canada, and Level’s Dare to Dream program, a charitable youth outreach program working to empower Indigenous youth to succeed. Like what we’re doing? Want us to talk about a specific film or idea? Reach out to us via email at aframeapartcast@gmail.com. You can also find us on Twitter, Instagram, Facebook, and Tumblr. Subscribe to the show on SoundCloud, Google Play, Stitcher, or the Pocket Casts app. Of course you can also find us on iTunes, so check us out there, rate, and subscribe to the show. Every subscription helps our visibility, so more people will be able to find and enjoy the show.